After working many years in the legal field, Glenna Tissenbaum took an early retirement and made a life-changing decision. Despite having minimal training and practice in the arts, Tissenbaum embarked on a new adventure that would plunge her into a world of infinite colours, textures, and potential. 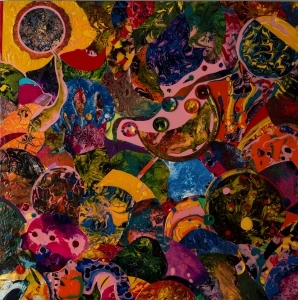 Overwhelmed by a desire to explore and make art, she acquired books, purchased artist-quality supplies and commenced her schooling in painting and mixed-media techniques. In contrast to Quickening — which is a positive feast for the eyes, Meeting at the Riverbed is more minimal in appearance at first glance. While the colours used in this piece may be described as “greyish and/or off-white” at most, there are textures at play. 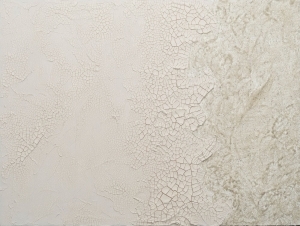 In this work, Tissenbaum experiments with Crackle Paste, which gives the illusion of cracked Earth next to a bed of sand, made with various acrylic gels. 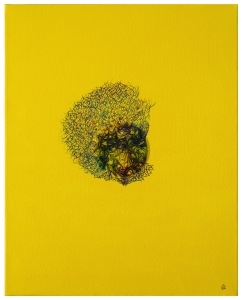 But as previously mentioned, Glenna Tissenbaum also favours the expression of mixed media. Her first creative exercise was a mixed-media project entitled: Gall-Liver’s Travails, inspired by the classic Jonathan Swift novel, Gulliver’s Travels. An antique “medical” G.I. Joe-type doll (the giant) lies at the centre of the piece with an assortment of toy soldiers and other small figurines subduing the strange giant. The work is mounted on a turntable to accentuate a world spinning out of order, and to provide viewers with different perspectives. Follow us on our new Instagram account (#elanqc) to see more of Glenna Tissenbaum’s artwork. See Previous Features and Shorts! August brings us the second wave of Arts Alive! Québec with simultaneous weekends in Quebec City at the Morrin Centre (August 3 – 4), and in Knowlton (August 3 – 5). ELAN’s partners have programmed an engaging array of performances and hands-on artistic activities for all ages. Click here for full details. ELAN’s 14th Annual General Meeting plus Schmoozer and Minute Market are coming up on August 27. The AGM is your chance to meet ELAN office staff and project managers, discuss what we have been working on, and get a glimpse of what is planned for the year ahead. It is also a chance to meet the current board of directors and vote in some new members. I hope to see many of you there. I want to pay tribute here to an old friend, Harry Gulkin, who passed away July 23 at the age of 90. I first met Harry in 1986. He was the new Artistic Director of the Saidye Bronfman Centre, and had programmed an ambitious season of theatre, music, readings and visual arts. I had recently graduated from the National Theatre School’s Playwriting Program and convinced Harry to hire me as General Manager of the freshly renovated theatre. 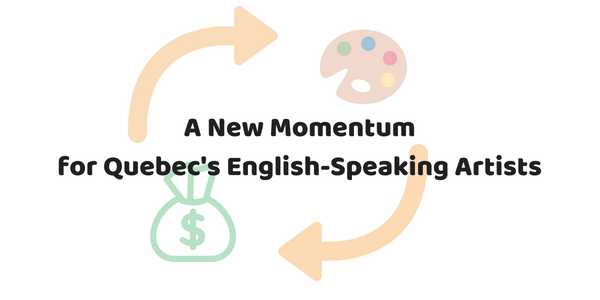 We embarked on a tumultuous season that incurred a significant deficit, and were both out of work when the Saidye Bronfman Centre’s chief benefactor put a stop to additional funding, bringing that particular adventure to a screeching halt. Fortunately, we both landed on our feet. Harry was immediately hired by SODEC (Société de développement des entreprises culturelles), the provincial funding agency film and television, and by a happy coincidence, a film producer I was working with received funding from SODEC to develop my script. When ELAN was created, Harry joined our advisory board to share his vast knowledge and passion for the arts. The NFB (National Film Board of Canada) documentary, Red Dawn on Main Street, and Bill Brownstein’s tribute in the Montreal Gazette provide some insights into a multi-faceted human being: merchant marine, union activist, retail marketing executive, artistic director, legendary film producer, and tireless champion of Canadian culture. Harry’s impact on Quebec’s cultural scene was immense, and his influence on those who had the privilege to know him was immeasurable.